Are you ready to explore Dubai? If “Travel More” has made it to your list of New Year’s Resolutions, then we have the perfect way to check off that box. 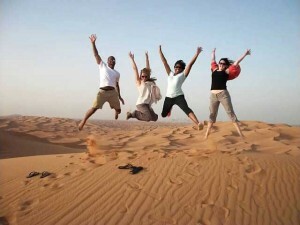 Join us at AESU for one of the most intriguing destinations that we offer, Dubai! Experience the city’s rich and mysterious culture, blaze across the dunes on a Jeep tour, and try your hand at riding a camel. Dubai is quickly becoming one of the biggest and most luxurious destinations in the world, but every explorer needs to play by the city’s rules. When relaxing at the pool or other parts of the hotel property, you can wear what you wish! But once you venture out to certain parts of the city it’s best to abide by the local customs. Dubai is an elegant city, so dressing up is very much part of the normal culture. When spending time in public places like the malls and mosques, the best way to blend in with the locals is to wear knee-length skirts or dresses, sleeved shirts, and non-sheer clothing. Dubai is a wonderfully romantic city, but not the best place to display your affection for your beau in public. If you’re married, then holding hands and kissing on the cheek is acceptable, but kissing on the lips or other displays of affection may offend the locals. Dubai has a slight obsession with luxury vehicles, but if you’d rather take a more economical approach to your travels then the metro system offers a safe alternative to chauffeured vehicles. Exploration on foot is frowned upon, but luckily there are plenty of boat tours and water taxis that offer spectacular views of the city. Contrary to popular opinion, Dubai is not actually a dry city. It’s more difficult to find restaurants that serve alcohol, but you can surely find a tasty beverage if you’re looking in the right place. Hotels, nightclubs, and a few upscale restaurants are your go-to spots for a cocktail or two. However, drinking in public or on the beach is not permitted. AESU offers unique, exciting travel programs for college students and young professionals at affordable rates. Each trip is action-packed and informal—designed just for people your own age. We are also able to design custom tours just for your group. Destination Dubai is an eight-day trip that includes a tour of the city, a trip to Dubai Beach, an optional catamaran cruise, and an overnight desert safari, complete with sand dune surfing. For those who are slightly less adventurous, you can ride jeeps or even camels across the many dunes. This entry was posted on Wednesday, January 4th, 2017	at 12:06 pm	. You can follow any responses to this entry through the RSS 2.0	feed. Both comments and pings are currently closed.